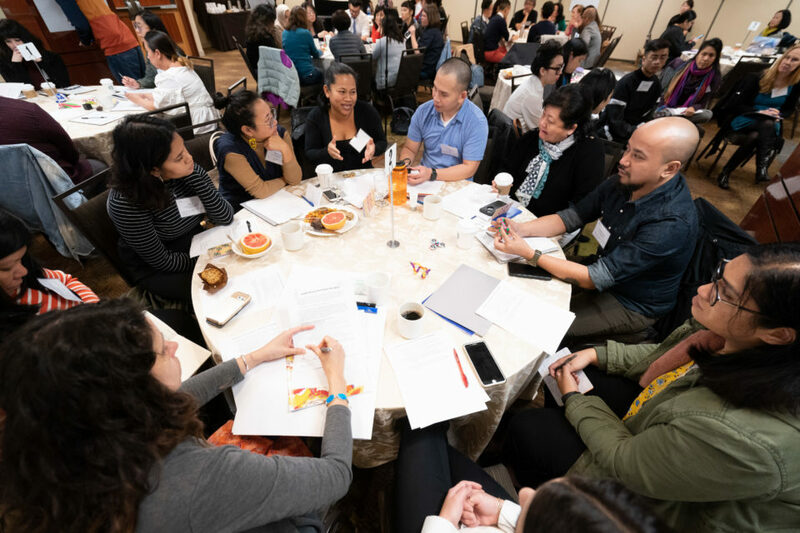 From January 14-16, 2019, the AAPI Civic Engagement Fund welcomed its grantee cohort, Steering Committee, and special guests to Los Angeles, CA for our annual convening. Attendees participated in a series of workshops and breakout sessions to share and learn together under the event theme, “Weaving Our Strength: – Integrated Civic Engagement Throughout Our Communities.” Faciliated by Nicola Chin and Jennifer Sconyers, the event kicked off with an evening panel discussion with Debbie Chen (OCA-Greater Houston), Vetnah Monessar (EMGAGE-Florida), Huong Nguyen (New Mexico Asian Family Center), and Jonathan Paik (Korean Resource Center) on their organizations’ experience of the 2018 Election. The program concluded with a drumming performance by children and youth drummers of the Korean Resource Center. Day Two began with “Weaving for Governing Power in 2019: Taking What We Learned in 2018 and Applying it to the Road Ahead,” a session that unpacked the most recent elections followed by small group discussions on how to build governing power in 2019 and in local elections. In the mid morning two concurrent workshops allowed groups the opportunity to learn about some strategies and practices relating to integrated strategic communications work. Bo Thao-Urabe (Coalition of Asian American Leaders) and Cha Vang (Hmong Innovating Politics) presented on their organization’s work in podcasts and storytelling. Korea Daily reporter, SangHo Hwang, and Co-Executive Director of Chinese for Affirmative Action, Vincent Pan shared their experiences and advice for working in and with ethnic media. In the afternoon, participants moved to the Japanese American National Museum for the “Collective Learning and Common Ground: Showcasing the Intersections of Politics, Race, and Organizing within Our Work” panel. Featured speakers, Stephanie Cho, Executive Director of Asian Americans Advancing Justice -Atlanta; Sujata Tejwani, who served as 2018 Coordinated Campaign Director in Georgia on behalf of Stacey Abrams; and Nse Ufot of the New Georgia Project and the New Georgia Project Action Fund delved into the intersections of politics, race, and organizing, and through the work carried out during the gubernatorial race in Atlanta.